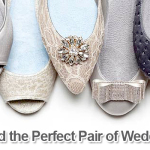 As an environmentally conscious couple, you want what you stand for to be highlighted in your wedding. 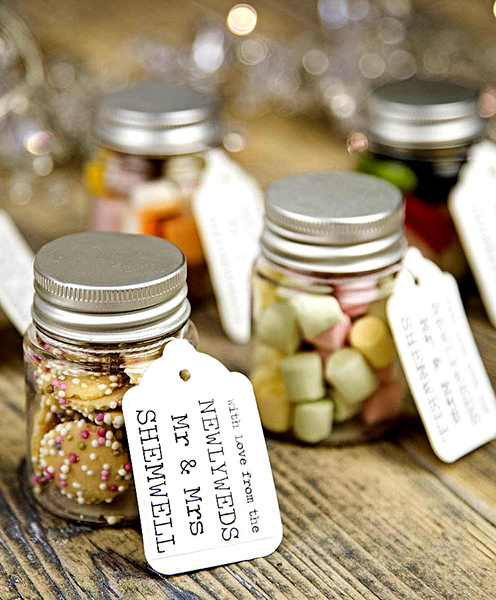 Most “green” couples despise the idea of wedding favors, because for the most part, they aren’t environmentally friendly. And, the ones that are can be severely lacking in creativity. 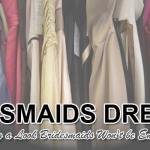 If you are having an eco-friendly wedding, do not despair. 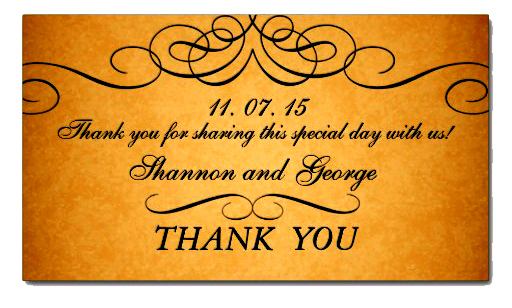 There are plenty of eco-friendly wedding favors to choose from that are as environmentally safe as they are fun. Seed paper cards are recycled and contain small plant seeds (or vegetable seeds) inside the paper. You can plant the paper directly into the soil – because it is biodegradable. Then your guests can enjoy a plant in their garden or even inside their home on you. 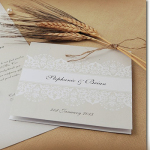 These paper seed cards can be customized and even written on for thank you notes. 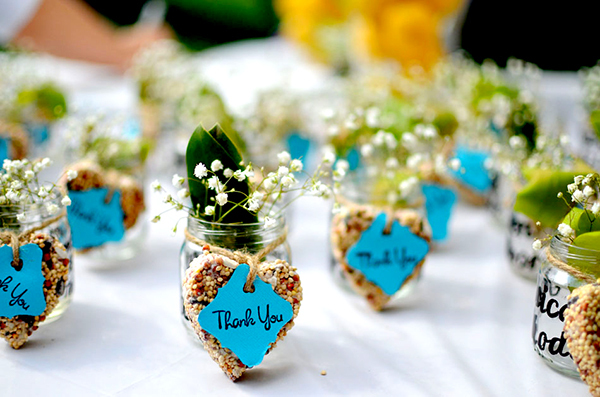 Give your guests mini herb or flower pots as they leave your wedding. 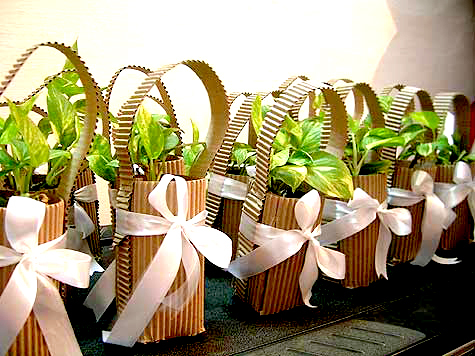 To save on money, do not buy planters; instead, wrap the roots with burlap or pretty tissue paper. 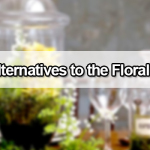 To make it fun, have a table with different herbs or flower types for your guests to choose from – just make sure you label each one and how to care for it, because not all of your guests will have a natural green thumb. Remember when you were a kid and you made bird seed feeders? Use that creativity again and make bird seed hangers for your guests. These eco-friendly wedding favors are super cute and you can use molds to create different shapes or even a monogrammed letter for your last name. Baked treats are edible; therefore, unlikely to go to waste – as long as they are tasty. You can have your catering company whip up treats to serve to guests as they leave, hire a cookie company to make custom edibles or just bake up treats at home to hand out. 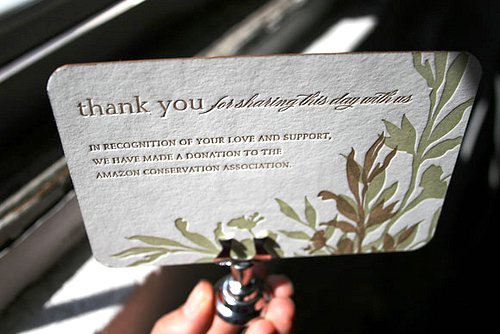 Instead of giving gifts to guests, give gifts in their honor to charities, local gardens, etc. You can even pick multiple groups and allow guests to pick and choose which organization they would like their honorable donation to go to. Soy candles are clean burning and smell great. 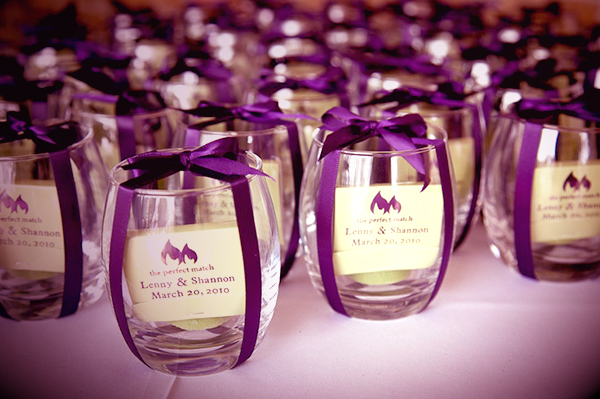 Whip up some homemade soy candles, in a variety of wedding colours, and give them out to guests. If you aren’t as crafty, you can always buy organic soy candles too. Hand out nylon or canvas reusable shopping bags to your guests. 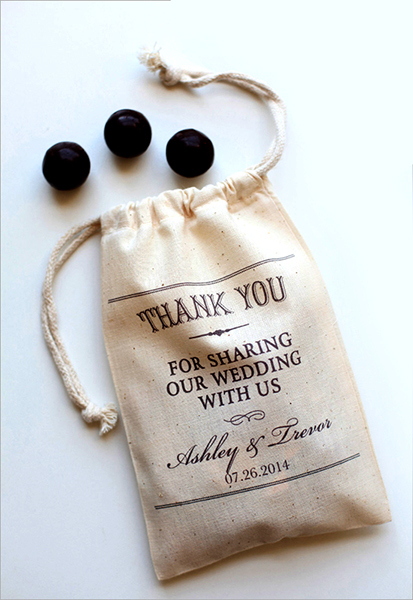 These can be folded in super cute ways – so you aren’t just handing out big bags. But, it helps your guests reduce their impact on the environment at the same time. 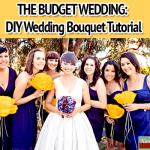 12 Unique Alternatives to the Floral Centrepiece. 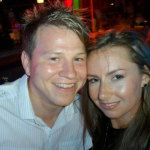 How Many People Should be in Your Wedding Party?